The children sit around synthesiser keyboards and they stare intently. They’re wearing headphones, wagging their fingers, bobbing their heads, as a beat plays inside. As music lessons go, this is surely the quietest one on the planet. The place we’re at is Gryphon School in Sherbourne, Dorset. Its music department is pretty well resourced, one of the best they tell me. There’s a keyboard on each desk, as well as Apple Mac computers where children can write music as they might write words on a word processor. While technology has turned today’s music to silence, they’ve discovered how it allows children to stop or start to keep up with a beat, to work at a pace that suits and develop musical talent wherever it is. It’s good work, though I wasn’t here to judge that. The local music adviser and NCET, the National Council for Educational Technology has though and today their music expert, Mick Thomas is here with a crew to film a new series of NCET TV. In fact he and the crew have moved into the area for a day or so, visiting other local schools such as Winton Boys’, and Thomas Hardye School and seeing how they use music technology for this month’s programme. NCET use leaflets, advertisements and exhibitions - all kind of other media to disseminate good practice and workable ideas with the technologies. But as NCET’s Jenny Brown explains, still only one third of teachers make regular use of IT in their work. "We often end up talking to the converted, so we’ve looked for way to reach teachers, all of whom now need to acquire IT skills as part of the job". With NCET-TV already one year old, the tripods, lights and trappings have already been around the country showcasing how information technology is working in schools. Right now they’re half way through the first new programme about music, portable computers and a kid’s IT centre. "OK, we’ll do Maggie’s link now" says producer, John Riley. He means Maggie Philbin, the programme’s presenter whose ‘link’ is a glue, and a message, as a confessed non-expert, that anyone can do IT. She is, it’s evident, unusually expert in learning the script, seemingly written on a bus ticket and delivering it word perfect. She’s putting on a braver face today, because her makeup kit was left behind. 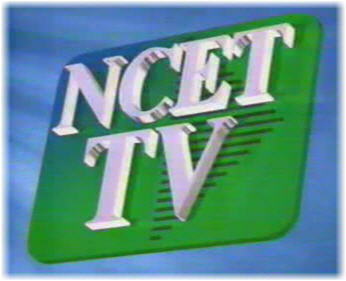 The first nine NCET-TV programmes have looked at subjects such as maths and geography, technologies such as the Internet and video-conferencing as well as ideas about gender and special needs. It would have been easy to interview manufacturers, a few visionaries and wave a camera at a school for good measure. But instead we watch an art teacher enthusing about using CD-Rom to look at classic paintings. We hear a head teacher of a school where IT no longer depends on a few staff tell about a culture "where everyone helps everyone". Case studies look at schools using portables and in one, where each member of staff had a Pocket Book palmtop computer the place is transformed and that IT ‘culture’ idea seems to be thriving. In a clip on special needs we see a teacher excited about a program for sign language: she types into the machine and it writes in signs, she deftly mouses ‘signs’ around the screen and you really feel that this is something to have a crack at. Were there an award for putting the case for IT, it belongs to her. So it’s real. NCET staff stay out of frame, while teachers appear as un-scripted as we come. Happily, the science that the brain starts working from birth, and stops the second you point a microphone at it, turns out to be not so proven. But sometimes you want to hear the director shout, "Cut! No sorry, start again that’s a platitude". With each program costing over £20,000, added to by the BBC charging a couple of thousand to use its night time Learning Zone slot, television appears expensive. A less obvious cost arose when teachers were invited to register for programme fact sheets, and it generated a too-successful mailing list of 12,000 teachers. This year however, there’s a charge to cover the postage - which hints at a good reason for using television to put across a message. A major evaluation of the series is just concluding, and NCET’s user groups told of IT co-ordinators using clips in school meetings, teachers given the responsibility for video recording, and a trainer who used one programme 18 times. Jenny Brown adds that everyone has ideas about what is wanted, but points to uses for which the series, aimed at the two-thirds of teachers not using IT, was never intended. Nevertheless, the fair game of council bashing is starting to shape the show: a newsy section, which provided a break, makes way for places to go and practical ideas. Those timeless issues such as progression, differentiation and how to manage with poor resources now feature too. Maybe it’s too much to hope for dramatic overnight changes, but with topics like art, careers, buying a computer and getting support for IT there are things to impinge on most of us, as well as testify that IT is working somewhere. As the programme shows at night, maybe the biggest challenge for the least IT literate will be getting the video recorder to wake up at 4 am.